Navratri Dates: When is Navaratri in 2018, 2019, 2020? When is Navaratri in 2018, 2019, 2020? There are four different Navaratri festivals that happen in India throughout the year. However, Sharad Navaratri is the most popular one. Sharad Navaratri, which is the focus of this article, usually takes place in late September or early October each year. The dates of the festival are determined according to the lunar calendar. It's usually a nine night festival that ends with Dussehra, the victory of good over evil, on the tenth day. However, some years it's reduced to eight nights or extended to 10 nights. This is because, astrologically, some of the days occur on the same date or occur across two dates. In 2019, Sharad Navarartri dates are September 29-October 7. In 2020, Sharad Navaratri dates are October 17-25. The other significant Navaratri festival, Chaitra Navaratri, will take place from March 18-26, 2018. It starts on the first day of the new Hindu lunar calendar, and its ninth day is Ram Navami. This Navaratri is most widely celebrated in northern India. In Maharashtra, the occasion is celebrated as Gudi Padwa, and Ugadi in south India. During Navaratri, Goddess Durga (the mother goddess, who is an aspect of Goddess Parvati), is worshiped in each of her nine forms. Each day has a different ritual associated with it. In addition, predominantly in the states of Gujarat and Maharashtra, there's a custom of wearing different colors of dress on each day. Day 1: Pratipada and Dwitiya (October 10, 2018). To mark the commencement of Navaratri, a ritual called Ghatasthapana is performed to invoke the energy of the goddess. On Pratipada, the goddess is worshiped as Shailputri, an incarnation of Goddess Parvati meaning "Daughter of the Mountain". She represents nature and joy. Astrologically, Dwitiya also falls on this day in 2018. This is when the goddess is worshiped as Brahmacharini, the unmarried form of Goddess Parvati. As she undertook great penance to get Lord Shiva to marry her, she's associated with pious strictness. The color to be worn on this day is royal blue. 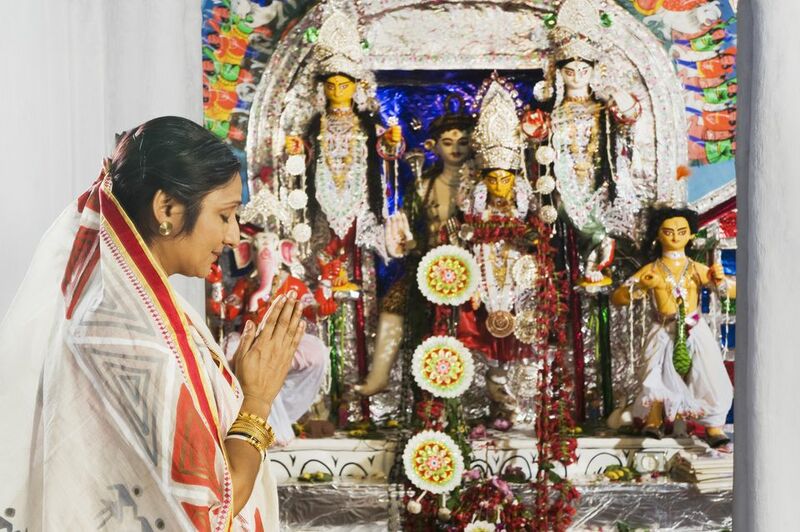 Day 2: Tritiya (October 11, 2018) is when the goddess is worshiped as Chandraghanta, the married form the Goddess Parvati. Her name is derived from the half moon on her forehead, which looks like a bell. She's depicted riding on a tigress, and is associated with bravery and courage to fight evil. The color to be worn on this day is yellow. Day 3: Chaturthi (October 12, 2018) is when the goddess is worshiped as Kushmanda, who lived inside the sun and is believed to have created the universe, giving light and energy to it. She represents the form of Durga that is the source of all. The color to be worn on this day is green. Day 4: Panchami (October 13, 2018) is when the goddess is worshiped as Skandamata, the mother of Kartikeya (also known as Skanda), son of Lord Shiva and brother of Lord Ganesha. She represents selfless love and purity. The color to be worn on this day is gray. Day 5: Panchami (October 14, 2018) Saraswati Avahan, when Goddess Saraswati is invoked, astrologically falls on this day in 2018. The color to be worn on this day is orange. Day 6: Shasthi (October 14, 2018) is when the goddess is worshiped as Katyayani, who Goddess Parvarti morphed into in order to fight and destroy the buffalo demon Mahishasura. She represents a warrior form of the goddess. The color to be worn on this day is white. Day 7: Saptami (October 16, 2018) is when the goddess is worshiped as Kalaratri, the dark night. She appeared to destroy some particularly evil demons in the battle against Mahishasura. She's the goddess's fiercest form and represents protection from all troubles. Saraswati Puja is also to be performed on this day in 2018 due to astrological cycle. The color to be worn on this day is red. Day 8: Ashtami (October 17, 2018) is when the goddess is worshiped as Mahagauri, the younger version of Shailputri who had a very fair and perfect complexion. She represents grace, the cleansing of sins, and betterment of society. The color to be worn on this day is sky blue. Day 9: Navami (October 18, 2018) is when the goddess is worshiped as Siddhidatri, who embodies all eight siddhis (supernatural powers). She is believed to have granted them to Lord Shiva when he worshiped her, and she also bestows them upon her devotees. The color to be worn on this day is pink. Note that in south India, Goddess Durga is worshiped during the first three days of the Navaratri festival, followed by Goddess Lakshmi during the next three days, and finally Goddess Saraswati on the last three days. Find out more about the Navaratri festival and how to experience the celebrations in this Navaratri Festival Essential Guide. If you're going to be in Delhi during Navaratri, try and catch one of these 5 Popular Delhi Ramlila Shows.